Located in the heart of the Mission Valley, this hotel is just minutes away from a plethora of popular attractions such as SeaWorld® San Diego and San Diego Zoo. 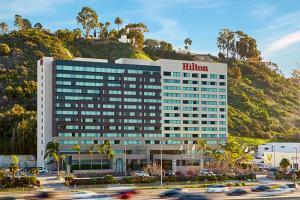 From the miles of scenic San Diego beaches, to the vibrant nightlife of downtown San Diego featuring the Gaslamp Quarter and PETCO Park, there's no shortage of fun and exciting things to do and see when staying at the Hilton San Diego Mission Valley. After a day of exploring all that this wonderful city has to offer, guests can relax and rejuvenate in comfortable and spacious guest rooms. Located in Mission Valley, just six miles from San Diego International Airport. Polanco Kitchen & Bar - Latin flavor with a Baja twist. Balboa Park, Museums, Belmont Park, Cabrillo Point, Del Mar Racetrack, Knott's Water Park, La Jolla, Petco Park, San Diego Zoo, Stephen Birch Aquarium, Seaport Village, Wild Animal Park.